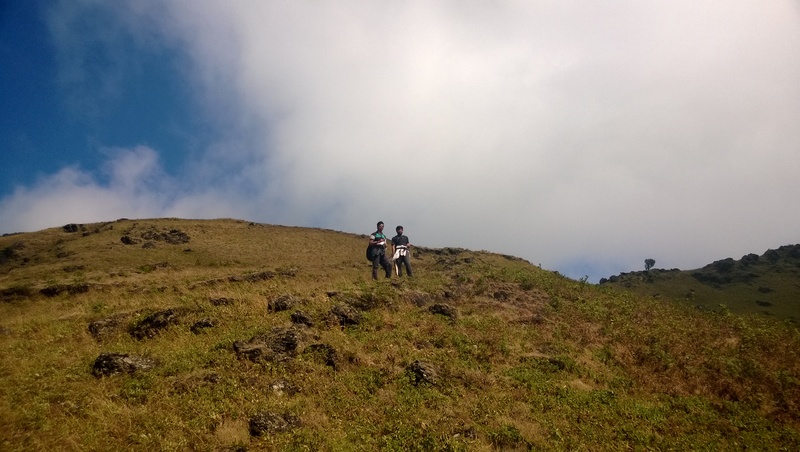 We had just completed a trek to Kudremukh peak under the hot sun the previous weekend. And we were looking for more fun. Abhishek set out to plan for one more and this time it was “Mullayangiri-Bababudddangiri”. 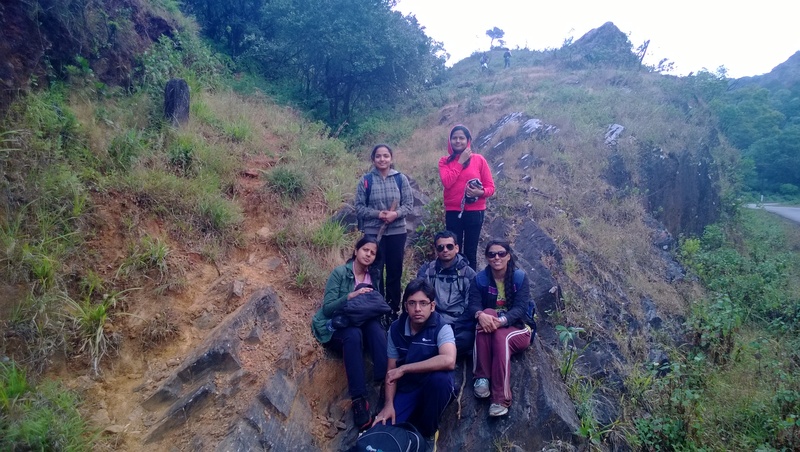 We did our research (Well, It was mostly Abhishek) on the trail, difficulty etc… Thanks to numerous blogs in the web! 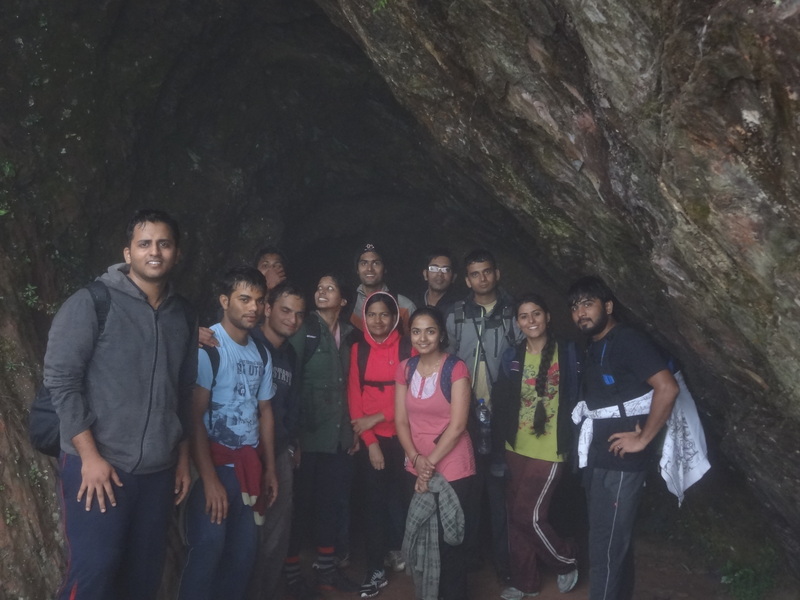 This time it was a much bigger group, 13 including 4 girls (Abhishek, Bharat, Karthikeyan or KK, myself Khushal, Mohit, Nachiket, Narra, Narveer, Prashant, Renu, Richa, Shaveta, Sudha). 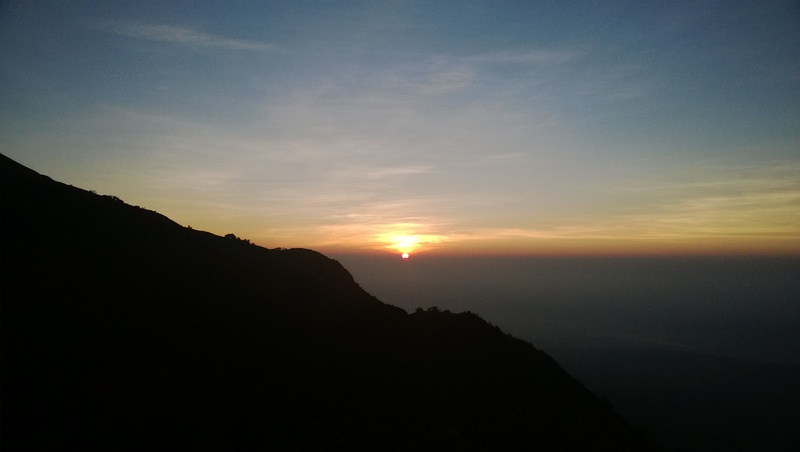 We started from Bangalore at 12 P.M, stopped at couple of places on the way for tea/snacks and at around 5.00 A.M, we were at the starting part of the trail. 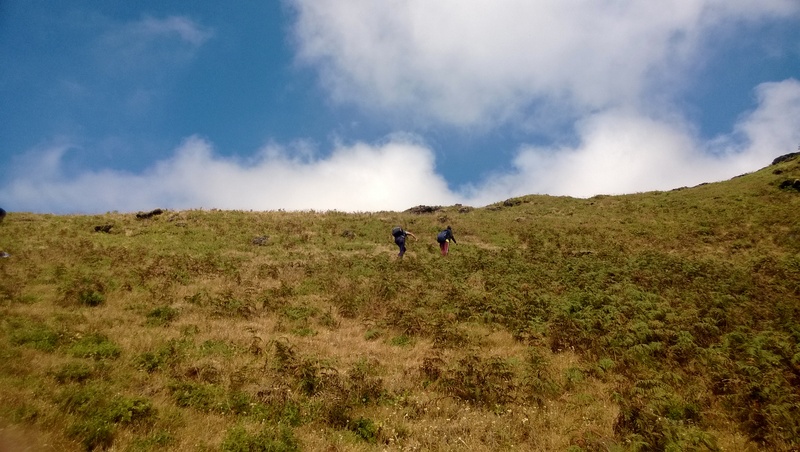 Our plan was to reach Mullayangiri peak first and then Bababuddangiri. We filled in our back pack with some essentials (an apple, few oranges, Snicker bars, couple of liters of water, limited first aid) and asked our cab driver to wait for us @ Bababuddangiri. We had to step outside with our torch as it was very dark. By 5.15 A.M, we were all set to start our trek. 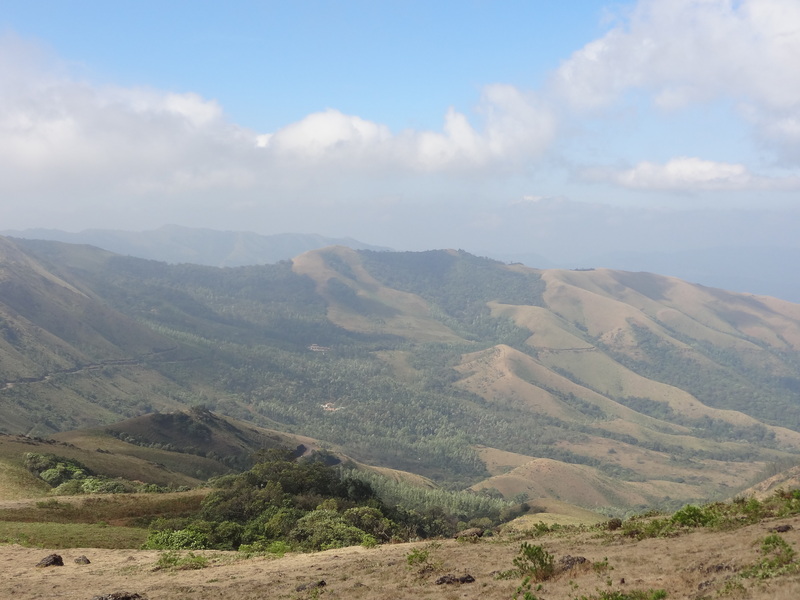 The starting part of the trail is called “Sarphadhari” because of the way the trail swings around. It’s a very narrow trail. We ended up forming a snake with Abhishek being the head & myself the tail. After walking for about 10 minutes, we realized that we are in a trail less treaded. Light from our torch didn’t penetrate the fog. 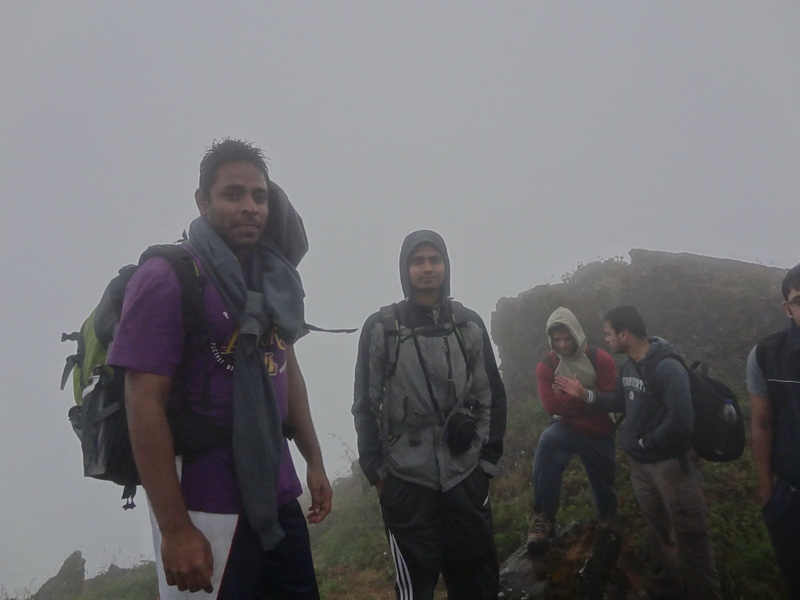 Before moving further, Abhishek, KK & Nachiket went forward trying to see whether the trail leads somewhere. After a while, we could hear all three of them shouting that they hit a block and we had to trace back. Now, I became the head of the snake ( 😉 ) and started tracking back. I found a right turn from our trail in about 50 mtrs and later came to know from Abhishek that we missed that turn when we crossed first time. We were back on track. The trail was a bit steep, but frequent change of direction made it a bit easier. The trail was mostly muddy, but there were few sections which had rocks. We had to cross these sections bit carefully, as they the rocks were slippery because of fog. 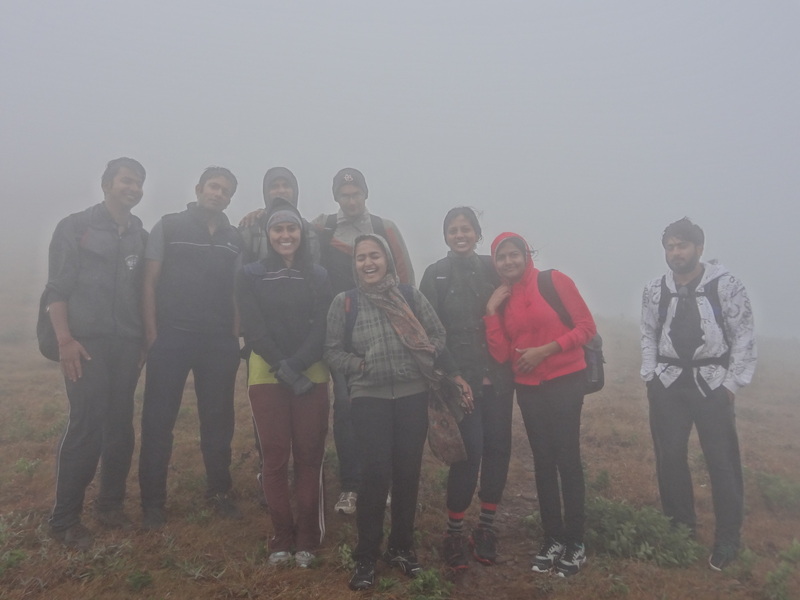 It was a different experience to trek with low visibility, lot of moisture in the air and heavy wind. We were all getting wet walking through fog. We took breaks in between, not so much to enjoy the view as the sun was not out yet and the maximum visibility was about 5 meters, but more to take rest. Within an hour’s time, we were near the peak. A slight deviation from the trail, took us to a bunch of caves. I was excited to find those caves in there. I could see a path heading deep into the cave (as far the light from my torch reached) and I was all up for exploring it further, until KK stopped us from getting in too deep. The peak was not more than 5 minutes away from those caves. 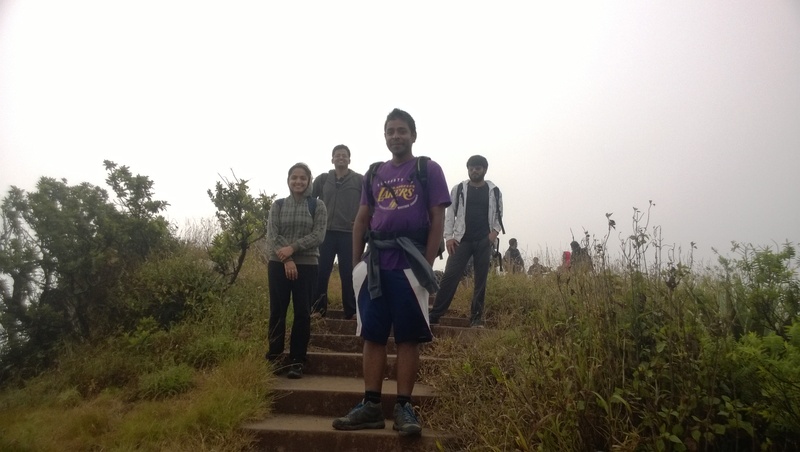 We were all happy to reach the peak. Wind was pretty hard at the top & fog still reduced the visibility. We spent about 15 minutes at the top with our usual photo session, singing, enjoying. There aren’t many things which are more delightful than spending an early morning at the top of a peak. I went out to search for the trail heading down. The priests at the top guided me to the trail leading down from the other side of the peak. Everyone was having fun coming down the trail. It was a constant downhill with interleaved flat sections. I had to check with Abhishek once in a while to see whether we are heading down the right trail as the visibility was till poor. By the way, GPS works! There was only one point where we felt it was a bit dangerous to come down because of the slippery rock. But we did cross that point with little trouble. After about half an hour, we could see sun coming out and the visibility was getting better. It was quite an experience to see clouds moving over the valley, leaving dark & bright patches all over the valley. The view was getting better & better and in another 20 minutes we hit a resting point laid with stone benches and Swami Vivekananda’s painting at the center. We spent around 10 minutes there, this time enjoying the view & taking a few snaps. About 50metres, down we hit the Forest check post. 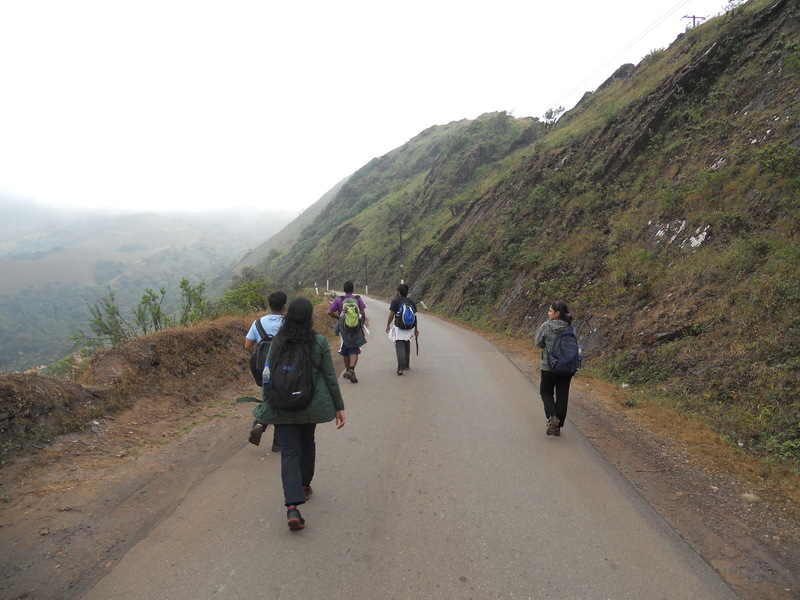 At this point, we were supposed to get on to the other side of the road & start our trek to “Bababuddangiri”. The ranges at the check post stopped us from entering the trail. They informed us that the starting section of the trail is closed for safety reasons & we could get on to later part of the trail if we go about a kilometer forward. We walked leisurely for about a kilometer. And there was no sign of a trail. We felt if we go forward we’ll end up walking on the nice paved road all the way till the top. We found a place as shown in below photograph, via which we could get onto the hill. 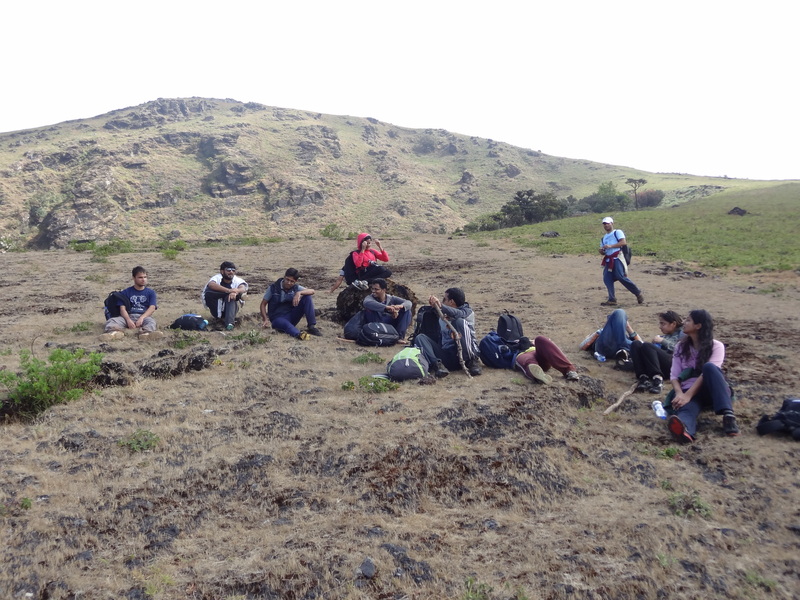 I, Abhishek and KK set out to find the trail and asked the rest of the group to rest for while. We were hoping to get back to the trail with little bit of help from GPS and our previous trekking experience. As we usually do, once we cross a good amount of distance one of us stayed there as a marker and the rest continued. This we practice to make sure we don’t lose the track (particularly, when no trail is visible) while returning or helping others. As I and KK were standing as markers, Abhishek went to assess the feasibility of the route. All throughout, every one made sure that the other two were visible by adjusting the distance between the markers. We confirmed that if we trek up this way for about 30 minutes, we’ll be able to join the actual trail. We went back and asked the rest of the group to join us. This section was relatively tough to the ones that we crossed since 5.00 A.M. It was already breakfast time & sun was not helping either. This section gave me a good trekking feeling with sun beating on our back and wind pushing us down. I should say it was pretty tough on first timers. Our group sort of got scattered across the slope (the climb up was not a piece of cake). 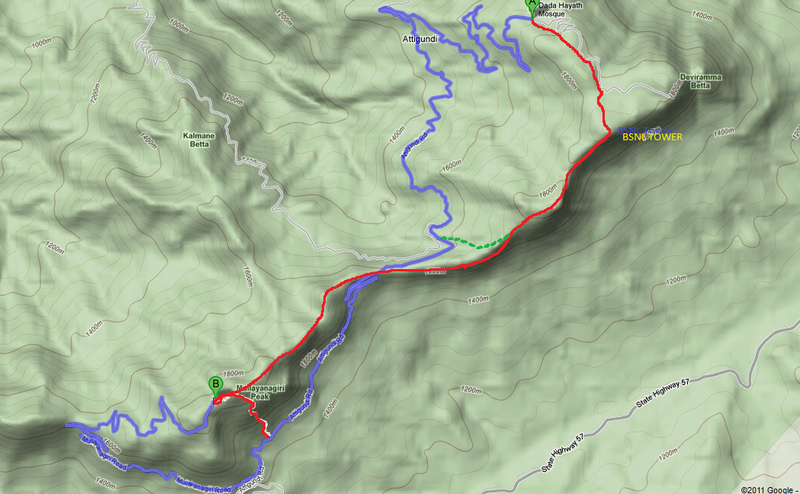 We took green dotted path shown in below image to get back on trek trail from motor-path. We found the actual trail finally. 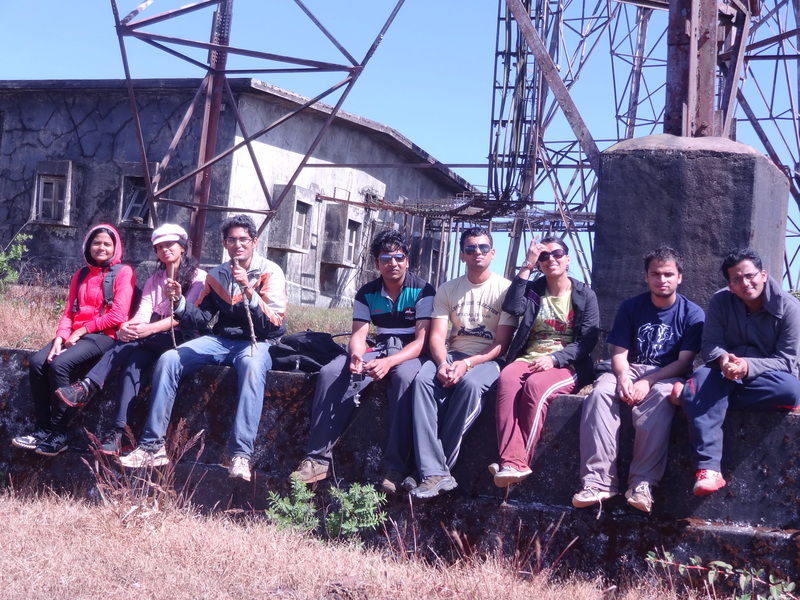 We were happy to see the “legendary” BSNL tower (has been mentioned in every blog) from there. We were able to see the first section of trail too, nice & neat on the ridge. I’m pretty sure the stretch on the ridge would’ve been fantastic. It was unfortunate that they closed the first stretch. From there, after about 30 minutes (& couple of short breaks), we were sitting nicely on the platform under the BSNL tower. We took a nice long break there. From there, we reached Bababuddangiri. 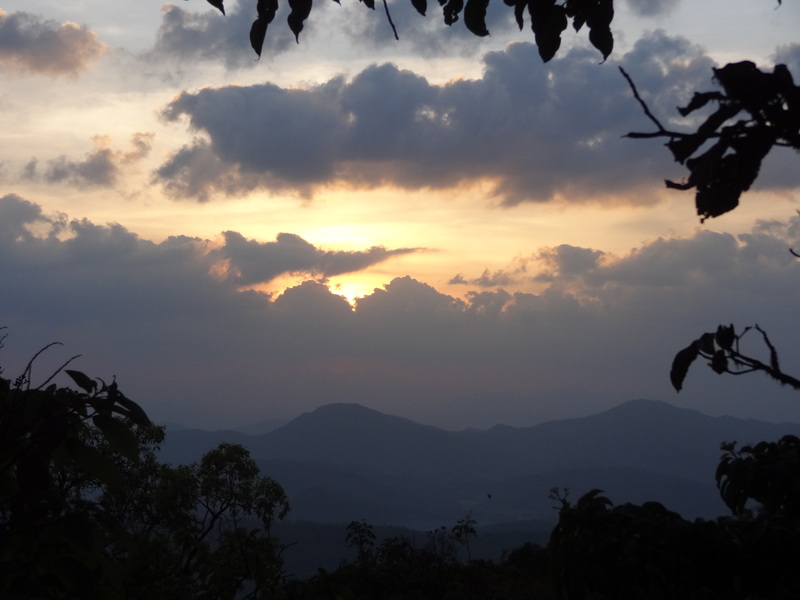 Our original plan was to camp somewhere near Manikya falls for the night. When we reached there, to our surprise all the shops were closed and we could see lot of police force. Narveer enquired about the whole ‘hungama’ and found that we can’t camp anywhere closer to the falls or around the peak. 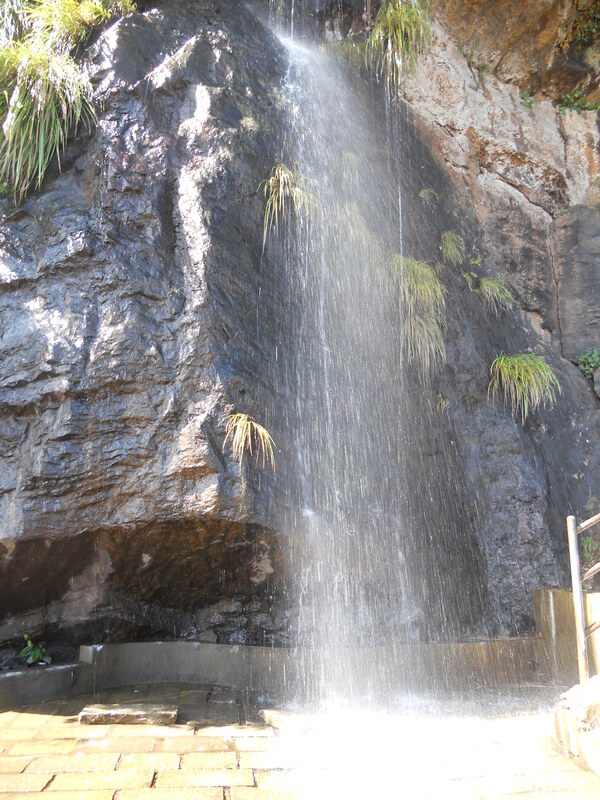 But the officers were courteous enough to let us freshen up in the falls. The falls was not a big one, but a nice one. Of course, with sun beating down on us, we were all ready to get drenched. Again, we were not let to do so by the officials there. We just re-filled out water supply, freshened up a bit and headed back to the tar road leading us down. Abhishek tried to call our cab driver to come & pick us up. But because of some restriction that day, no tourist cabs were allowed post the check post. So, we had to walk back under hot sun. Luckily, we found our cab midway (Our driver was able to sneak in by offering a ride to the officials uphill). Our camping plan was about to crumble. Abhishek & KK decided to ask the officials to see if they can permit us to camp near the check post (near the Vivekananda painting). 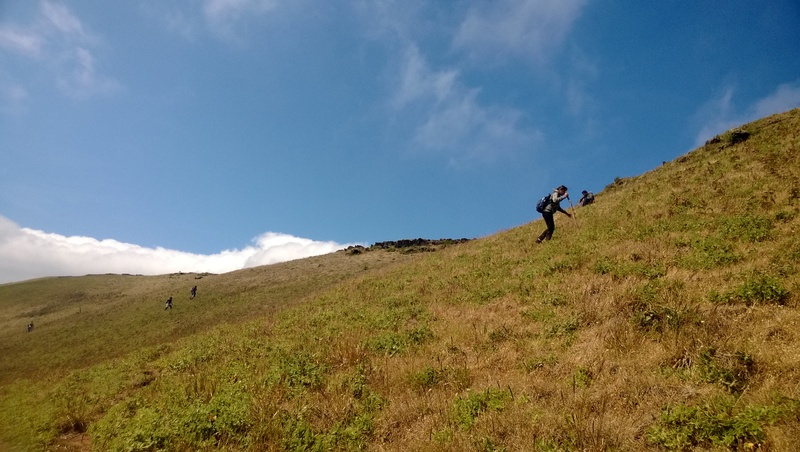 But we were denied permission to camp there too and the officials informed Abhishek that either we can camp on top of Mullayangiri or couple of kilometres down from the check post at Seethalayanagiri. We reached place at Seethalayanagiri which was roughly 20 minutes drive down from the check post. Abhishek & KK went out to check for a place to camp and found a decent spot near a temple. We started unpacking our stuff to get our tents ready. 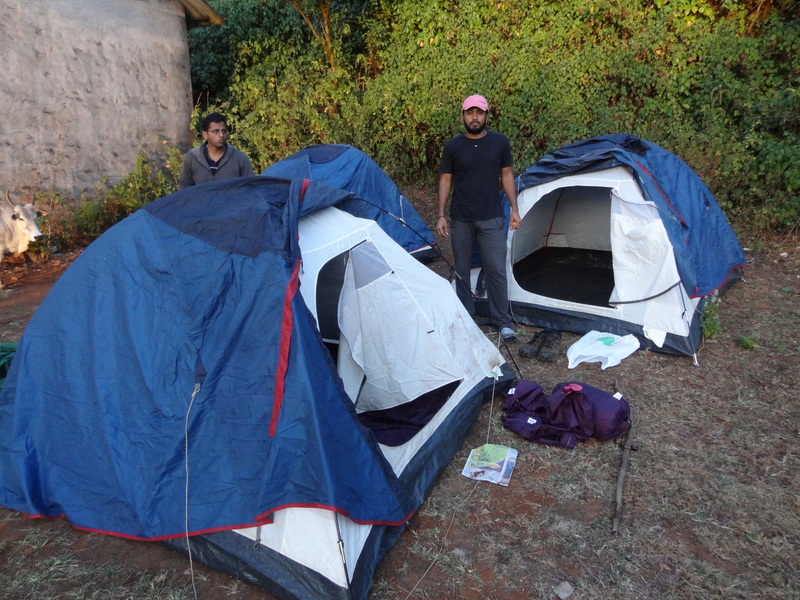 Luckily this time, couple of us learnt how to setup a tent. Within 20 minutes, all the tents were up and we were all set to start cooking. It was around 4.00 P.M already and I don’t think anyone had a decent meal from morning. Renu & couple of other people spoke to the temple authority to camp at that place in the meantime. Bunch of us started collecting fire wood for cooking and the girls partitioned the tasks under Head chef Renu. I would like to thanks my best friend Z to encourage and appreciate me for blog writing and Karthikeyan to edit my initial draft. Thank you, you people are awesome. Keep in touch !! Really a very good collection and detailed info.. 🙂 .. like! The second last picture is just outstanding.. and even the pic at the “legendary” BSNL tower. Nice work Khushal 🙂 Keep it up !